In all of 2019 the main focus will be on dresses, from mini to wedding gown. Added to this I will be making shrugs, robes, waistcoats, capes and capelets. Everything will be made as one or few of a kind, without the possibility to place a custom order. There is simply no time for this service being a one person fashion label with a little kid. Added to that I always found it quite stressful to give this service, I work best with an open agenda. Also, I always got way too many requests, which made it impossible to decide who to make something for and who not :o Thank you for understanding! Finally I will put my beautiful embroidery machine to good use! In 2018, being pregnant and surviving & enjoying the first 9 months with a little son, there was simply no time to explore this new area. In 2019 I will certainly add many designs with (often self designed) embroidery to my collections. In 2019 I will be adding more and more supplies to the shops. I have some awesome lace suppliers who are not online, I look forwards to share their pieces with you! In 2019 I will be making more art work. If I think it is good enough, you will find it on my pages. Amongst other things I will be making design drawings in ink with water colour. On both shops you will find the main collection of designs. 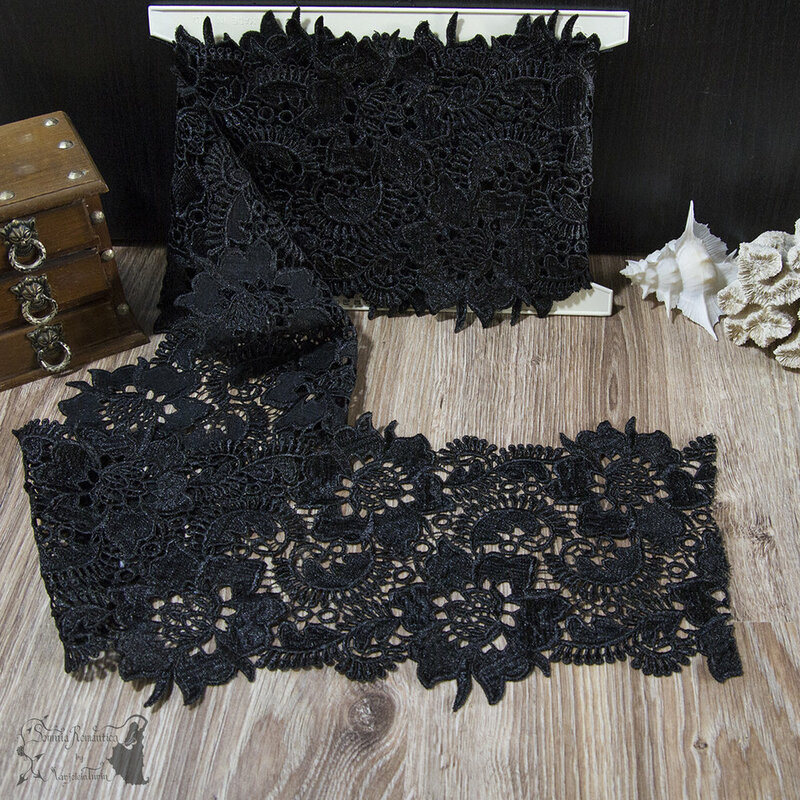 On both shops you will find lace that I have available in large quantities. On my homepage new items will be launched one month earlier than on Etsy. On Etsy only you will find all Clearance items, both designs and supplies. We as a family are doing well! Ezra is 9 months old by now and he is a curious, active and friendly little chap :) He is standing, going through the whole house, babbling all the time. I could go on, but this is a fashion blog, not a babyblog…! My husband and I are looking forward to the new year, both on personal level and on a professional & creative level. If you have any question feel free to comment or to email me! All you need to know until the end of 2018! Sooo, as I have been busy with a big addition to my online existence, which I will post about below, November has almost no time left to make new creations. Therefore I decided that I will post all I have in my Etsy shop and fill this shop again from the new year on! The materials that I will be selling, will mainly come from Dutch wholesales and Markets, which do not sell online. I have a few gems, who sell both high quality new laces and also vintage laces. Like my favourite wholesale, who often buys all the collection from physical shops that quit. Or my second favourite wholesale, who has lots and lots of French laces. Or my favourite market stand, who purchases bit lots from old shops etc, his collections are part mediocre, part just nice and part plain gems. From today until Christmas, I will be making new designs again, which will be launched just before Christmas. Wishing you all wonderful holidays! Made in October, online in November! It is the start of a new month! All new pieces I made will be uploaded here for all of November. The October pieces migrated to my Etsy shop. It will take some time, I hope to have everything uploaded this weekend, otherwise stay tuned for a little while! Having a 7 months old kid by now, all is well. But time is short! This month has been rather colourful. I had some gorgeous fabrics on my shelf that needed to be made into something. I was waiting for the 100 % perfect match in lace trims, but decided to combine them with black or cream, which atually turned out pretty nice. Added I made some pieces with incorporated capes, a true plus size shrug and some just cute little somethings :) Below you can see all the previews! It is the start of a new month! All new pieces I made will be uploaded here for all of October. The September pieces migrated to my Etsy shop. It will take a little time, I hope to have everything uploaded today, otherwise stay tuned for a little while! After almost 6 months of maternity leave I am back in business. I gave birth to a healthy son, Ezra. We feel blessed. Recovery however was intense and took longer than expected. By now I am doing well again and I am happy to be creating pieces again. The past months I have been making some new outfits of which you can see previews here above. For the time to come, I will be making more new pieces. As time is limited with a 4 months old kid, I will not do any fashion shows or self organized photoshoots for at least this year, but probably also for a good part of 2019. I may lend some pieces for shoots, further my main focus will be (apart from my family!) to create many beautiful new pieces. All pieces will be one or few of a kind, with no possibility for custom (fit-) orders. I will vary the size, more new pieces in L and XL will also be made soon! Please consider that I am just a one person fashion label, so I can’t offer a big range of sizes and styles. I will put everything I have online in my Etsy shop in the coming few days. Part of the older pieces will go into a sale, as I need room in my closet! After this reopening, I am anticipating on doing a monthly (or at first twice a month) launch of new pieces. The plan for the rest of 2018 is to make mainly dresses of all sorts, waistcoats and shrugs. Some will be made by 3-5 pieces in a range of sizes, many will be one of a kind, in a set size. Last, but not least, there will be an abundance of lace of course! 1 day until I'm back online...! 2 days until I'm back online...! 3 days until I'm back online...! The maternity leave has started! The webshop here will be temporarily offline. During my maternity leave the Etsy shop will also close for a little while. After that all of my pieces will be stored in the Etsy for as long as the leave takes (approximately end of June). After the leave some exciting plans for the new collections of Somnia Romantica will be revealed. Whenever I can I will post updates here or on my social media channels. I'm looking forward to the rest of this year!